St. Lucia is tiny island in the eastern part of the Caribbean with plenty of water sports, awesome diving spots and the place constantly named the Honeymoon Capital. With azure waters, warm sand beaches, and varied topography that includes forests, rainforests, mountains and the underwater realm, it is no wonder that St. Lucia tourism is booming. St. Lucia travelers are treated to a cornucopia of sights and sounds, especially when you head on over to the Sulphur Springs. The stench of rotten eggs will likely be the first thing to draw your attention, but watching the bubbling pools of water and getting to play in the mud pools (the healing mud that cures all that ails you) are also things you don’t see or do every day. These pools naturally release the underground pressure, and make for an interesting tour for the vacationer. The Diamond Falls Botanical Gardens and Mineral Baths don’t share the same eggy smell, but they do provide St. Lucia’s tourists with a relaxing day out. Waterfalls, pools and the mineral enriched water sit amid the foliage and exotic flowers of the gardens that used to be house old coconut plantation. 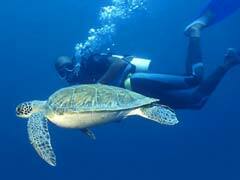 For those looking for eco-tours and the opportunity to help out some wildlife, the Debaras Turtle Watching adventure is for you. Here visitors to Saint Lucia partake in an overnight trip that is conducted on a beach in tents. When the leatherback turtles make landfall, it is your job to measure and tag them and if you visit later in the season, it will be your pleasure to witness the tiny hatchlings coming out of their eggs and making their way to the ocean beyond. This tour is something that is not only educational but helps in tracking the turtles to better understand and help the species. 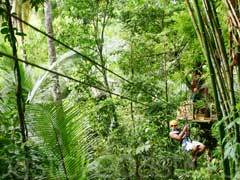 The St. Lucia Rainforest offers travelers to the island the chance to tour a real rainforest with the gigantic ferns and foliage which you can choose to zip line through or take an aerial tram over to garner the best views of the area. You can hike or take a van through with informative native guides that know all about the vast ecosystem and why it is an integral part of the island. 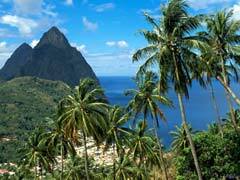 The Pitons are the most photographed landmark on the whole island and one look will help explain why. These two giant forms seem to just rise up out of the sand and are places where tourists to St. Lucia can climb to see the breathtaking views. All climbs are with a guide and can be a big gruelling, but just looking at them and marvelling in their beauty is okay too. The bottom of the peaks features an information center where visitors can learn about the geology, plant life and history of the area. The Pitons can be seen in their amazing beauty during a hike along the Tete Paul Nature Trail and from many other points across the island. Travelers to St. Lucia that travel to her capital, Castries, are met with the lovely Rodney Bay, a man-made lagoon with lots of shops, bars and places to eat nearby. Rodney Bay is one of the most popular beaches on the island and offers tourists the warm sand, clear waters and opportunities to dive, snorkel, sail or take part in many other water activities. For great views of the Castries’ harbor and city, check out Morne Fortune, a hill with the 18th century Fort Charlotte atop it. Along with the views, travelers to St. Lucia can see old stables, an old sugar mill and cannon which make for an interesting place to explore. The Cathedral of the Immaculate Conception is a church in Castries that offers tourists to St. Lucia a gorgeous apostolic building complete with Clocktower lavishly finished with a Baroque interior. There are numerous paintings lining the walls, and the saints are pictured on the colorful ceilings where visitors can go to witness the architecture and religious history of the island nation. Our Planet is a museum that takes you off the beach and takes you on a tour of discovery about where we call home. What does it look like from space? How do hurricanes occur? How do they power cities? With experiments, hands-on activities and movies about extreme weather and other natural phenomena, this museum is a great way to learn and expand the understanding we have about where we live. All around St. Lucia are places to scuba dive and become as one with the ocean playground that lies beyond the sand. Scuba packages can be had that also include snorkeling on the artificial and natural reefs, hiking, and kayaking both along the coastal regions and in the river system inland as well. Scuba the reefs and the many shipwrecks while you see varied marine life and have the underwater world at your disposal. For fun on land or in the sea, St. Lucia is the place to be. Rock of Cashel – Top 10 Interesting Facts!